All substances are made of atoms. An atom is the smallest part of an element that can exist. There are about 100 different elements. Elements are shown in the Periodic Table. Compounds are formed from elements by chemical reactions. Chemical reactions always involve the formation of one or more new substances, and often involve a detectable energy change. Compounds contain two or more elements chemically combined in fixed proportions and can be represented by formulae using the symbols of the atoms from which they were formed. Compounds can only be separated into elements by chemical reactions. Chemical reactions can be represented by word equations or equations using symbols and formulae. A mixture consists of two or more elements or compounds not chemically combined together. The chemical properties of each substance in the mixture are unchanged. Mixtures can be separated by physical processes such as filtration, crystallisation, simple distillation, fractional distillation and chromatography. These physical processes do not involve chemical reactions and no new substances are made. Filtration is a method for separating an insoluble solid from a liquid. A mixture of liquid and solid is passed through filter paper into a flask below. The solid stays on the filter paper (residue), and the liquid passes through to the container below (filtrate). Crystallisation/evaporation is a method that separates a soluble solid from a liquid. A solution of liquid and dissolved solid is heated, causing the solvent to evaporate and leaves solid crystals behind. Simple distillation is a method for separating the solvent from a solution, leaving behind the solute. This method works because the solvent has a much lower boiling point than the dissolved solute. Heating the solution allows the solvent to evaporate, and then it passes through a condenser, where it is cooled and condensed into a separate container. The solute does not evaporate and so it stays behind. 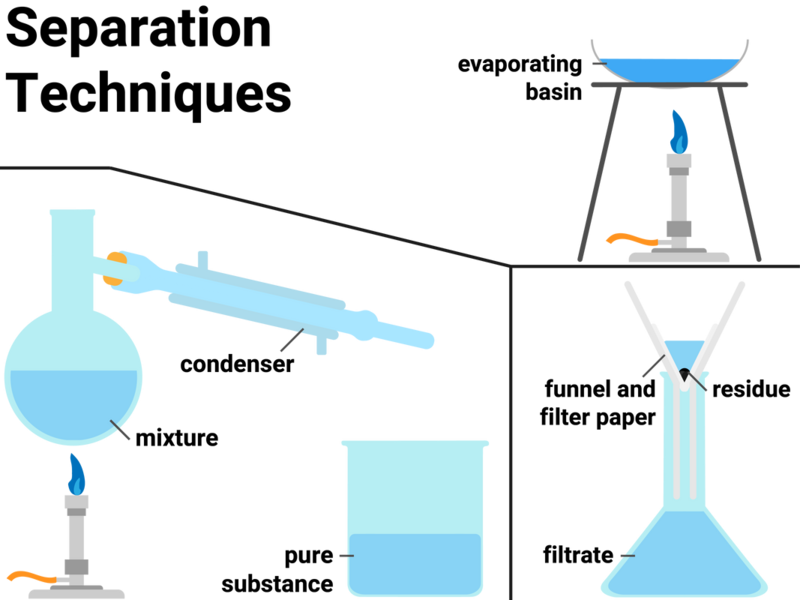 Fractional distillation is a method of separating multiple liquids from each other. The technique works in the same way as distillation, but on a much larger scale. New experimental evidence may lead to a scientific model being changed or replaced. John Dalton thought that all matter was made of tiny particles called atoms, which he imagined as tiny spheres that could not be divided. J.J. Thomson discovered the electron. He suggested a plum pudding model of the atom. In this model the atom is a ball of positive charge with negative electrons randomly distributed within it. Niels Bohr adapted Ernest Rutherford's model. Bohr did calculations that led him to suggest that electrons orbit the nucleus in fixed energy levels - called shells. The shells are at certain distances from the nucleus. Later experiments led to the idea that the positive charge of any nucleus could be subdivided into a whole number of smaller particles, each particle having the same amount of positive charge. The name proton was given to these particles. James Chadwick found evidence for the existence of particles in the nucleus with mass but no charge. These particles are called neutrons. Atoms are made from three types of subatomic particles: protons, neutrons and electrons. On the Periodic Table you will find every element that we know about, which in turn is a list of every atom that we have discovered. Every atom of the same element has the same number of protons as electrons. This is because every atom is neutral. An atom has a radius of about 0.1 nm, with about 99% of an atom being empty space! The radius of a nucleus is less than 1/10000 (that's really small!) of that of the atom.​ Almost all of the mass of an atom is in the nucleus. The proton number of an element defines the element. Every atom of one element must have the same number of protons. All atoms have the same number of protons and electrons. This is because atoms are neutral, and this is achieved by having the same number of positive charges (protons) and negative charges (electrons). Not all atoms have the same number of neutrons. All atoms of carbon have 6 protons, making its atomic number 6. Most of those atoms will have 6 neutrons, making the mass number 12 (6+6). 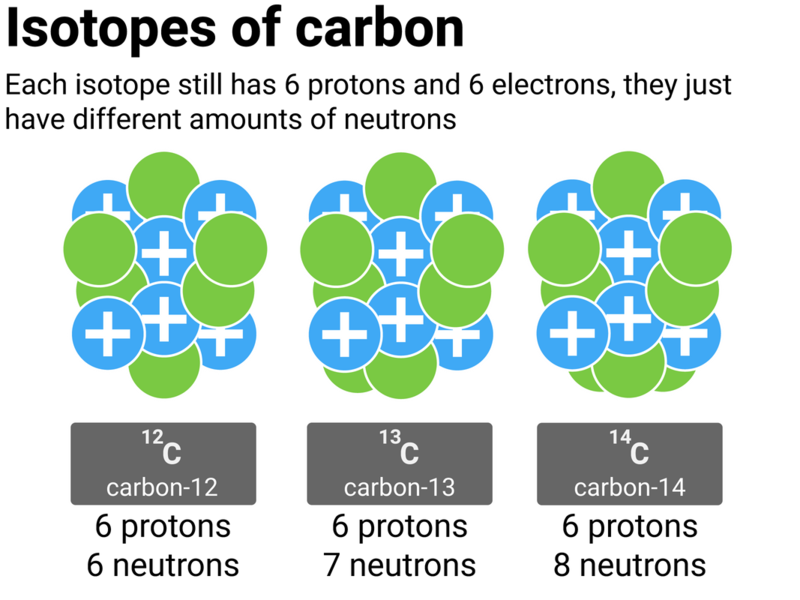 However, some atoms of carbon have a different number of neutrons, making the mass number different too. Not all atoms have a whole number mass. Chlorine, as an example, has a recorded mass of 35.5. This is because we have to take the masses of all an element's isotopes into account. We can use the percentage abundances (how common it is) and the isotopes' masses in the equation below to calculate a relative atomic mass. Electrons orbit around an atom in a certain pattern. Around the nucleus are different energy levels, often called shells. Each shell can be filled to a specific number of electrons, and these limits are the same for every element. Each shell must be filled before another shell can take electrons. We can either write, or draw, the electron configuration of an atom. Here you can see the electron configuration of potassium.